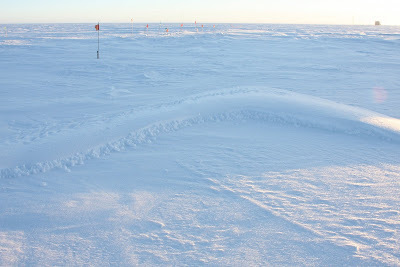 Last Friday, we here at pole were treated to one of the rarer weather phenomena in Antarctica. We woke to find the landscape littered with little spherical puffballs. Dana (the other SPT winterover) had been telling tales of the strange cottonballs which mysteriously turned up one day four years ago, then disappeared just as mysteriously the following day, and he was thrilled to see them again. This time, though, they showed up during daylight, and that made all the difference. The temperature had dropped suddenly, and the ground was covered in hoarfrost. Looking across the plain, dozens - hundreds, probably thousands - of little balls were tumbling in the wind. Think tumbleweed - natural snowballs made of the fine frost covering the ground for miles around were rolling along, almost jovially, without a care in the world. It was actually a pretty comical sight, the whole landscape suddenly alive with motion. 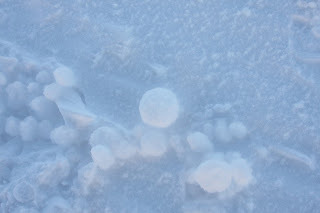 The little balls are called yukimarimos (formed from the Japanese word for snow and the name of a small globular water plant from Hokkaido), and form when a light wind follows a sudden drop in temperature to below -60C (-80F), rolling the frost into snowballs. The yukimarimos collect in any little crevice or hollow, forming into large piles until a gust of wind disperses them, or they sublimate back into the atmosphere. They rarely last more than a day. Yukimarimos were described for the first time in 1999 in the Journal of Glaciology, after almost 50 years of continuous inhabitation of the antarctic interior - that should give some idea of their rarity. Oddly, they have the consitency of cotton candy, almost exactly. 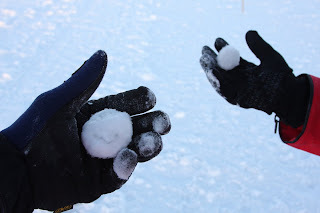 Nothing like a hand packed or rolled snow, they're disctinctly fibrous, virtually weightless, and dissolve almost instantly if you take them inside. I'm running out of words to describe how amazing and unique the world down here is. Incredible, surprising, and always novel. Keith - 1st time i've written. Your blog is fascinating, and I've been following it avidly. This phenomenon (yukimarimos) seems to be similar to the "snow rollers" which occurred here in your home town of Fredericton in December 2007, for the first time in decades, apparently. There were literally hundreds of them in the fields around the Research Centre where I work - like tumbleweeds made of snow. Interesting that these two similar (and rare) phenomena would occur in roughly the same time frame, yet so far apart in distance - cosmic connection, or coincidence? I wonder - especially as you are now living in ... the twilight zone!